With a series of successful test firings completed by Orbital ATK, engineers are gaining confidence in how their five segment boosters will perform in their role in helping the Space Launch System (SLS) push through first stage flight. 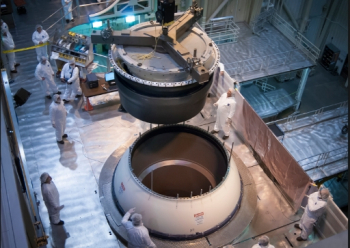 With the first two flight boosters in production, Orbital ATK is also disassembling the QM-2 motor, which test fired back in June, allowing for all of its parts to be inspected. It’s been a long road for the five segment version of the Solid Rocket Booster, as it evolves from its role with the Space Shuttle. The move to the extended version of the motor began with the Constellation Program (CxP) as a single in-line first stage for Ares I, before transitioning back to the traditional use of two boosters on either side of the core stage for SLS. Testing of the larger motor involved three Demonstration Motor (DM) Static Fire tests, with the results feeding into the first of two qualification tests. The first of those tests, QM-1, was delayed due to issues found during the inspection of the aft segment, which was found to have a two foot-wide area where propellant had debonded from the inside of the segment wall. However, following a resolution of the issue, the booster successfully conducted a test fire in early 2015. 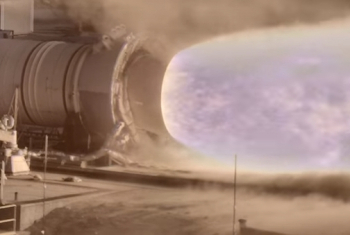 Showing lessons had been learned from the QM-1 booster flow, the build up and processing to the QM-2 firing was very smooth, allowing for the final qualification test to take place last June at the Promontory test site in Utah. The quick-look results from the test were positive, with data streaming in from more than 530 instrumentation channels on the booster. “Preliminary analysis from the test shows the instrumentation performed extremely well and gathered the critical data needed to show that we met our test objectives,” said Mat Bevill, deputy chief engineer for the SLS Boosters Office at NASA’s Marshall Space Flight Center. However, a key point of the ground test – and the reason the test ended with a giant robotic fire extinguisher putting out the flames – is to allow for a full inspection on the internal workings of the booster. Orbital ATK engineers began by disassembling the booster aft exit cone. Each segment of the booster will be taken apart and will undergo a detailed inspection to support verification that the booster design meets SLS requirements. “We still have many months to go to analyze all the data from the second test, as it’s a very detailed process,” Mr. Bevill added. “That process includes disassembling the 154-foot-long booster and getting a thorough look at every part of it. “The detailed inspection, including the post-test measurements, will support verification that the booster design meets SLS requirements and performed as expected on test day. With 82 qualification test objectives to pass, the results will feed into design certification review. This key review will effectively provide a green light for the big boosters to fly with SLS on Exploration Mission -1 (EM-1) and through the bulk of the missions that SLS will be tasked with during the 2020s. The two boosters set to launch on the 2018 debut of SLS are already in taking place with four segments being cast and a fifth going to casting later this month, according to Alex Priskos, manager of the SLS Boosters Office. Once cast, prepared and inspected, the segments will ride to Florida on the same train cars that supplied segments for Shuttle missions. 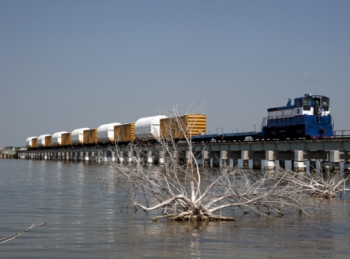 The last time a train with SRB segments arrived at the Kennedy Space Center (KSC) was back in 2010 in support of the final shuttle missions. The segments are then offloaded and mated together via a process known as Booster Integration. They will be stacked on the base on the Mobile Launcher and built up inside the Vehicle Assembly Building (VAB) High Bay. This process will be completed ahead of the arrival of the Core Stage of SLS – complete with its four RS-25 engines – via the modified Pegasus Barge. The core is then lowered in-between the two boosters via the huge VAB Crane System. In preparation for those events, Orbital ATK is already working at KSC on aft skirt refurbishment work. The modified boosters will eventually be replaced by an even more powerful version, per the requirements of additional lift capacity for the missions to Mars. Orbital ATK is odds-on favorites to be the supplier of the “Advanced Boosters”, with their concept noted to be 40 percent cheaper and 23.5 percent more reliable than its current five segment boosters. Nicknamed the “Dark Knights”, these boosters are envisioned to be a key part of the final SLS configuration, known as the Block 2 – a rocket capable of a 130 metric-ton lift capacity. 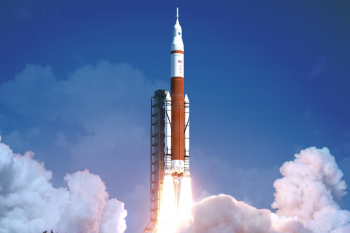 However, as to when – and indeed if – the advanced boosters are debuted with SLS, the question remains open to speculation as NASA’s funding cycle only reaches out into the short-term. Interestingly, evaluations continue to show “over performance” against the baseline 70 mT and 105 mT ratings, which have been further aided by the future incorporation of the powerful Exploration Upper Stage (EUS). 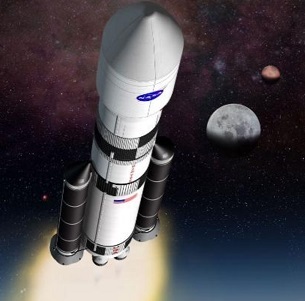 It has been claimed internally, that the Block 1B, with advanced boosters and EUS, could achieve most – if not all – of NASA’s deep space exploration goals, potentially removing the need to evolve to the Block 2. 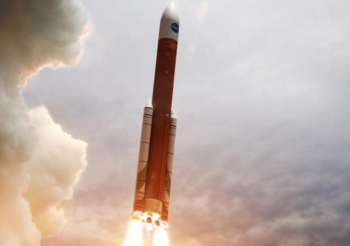 NASA, however, continues to cite Block 2 for its main Mars missions. Notably, the Block 2 isn’t expected to debut until the end of the 2020s at the earliest, by which time SpaceX’s even more powerful Exploration Class rocket for its Mars Colonial Transporter (MCT) system should already be flying.